Nine years ago yesterday, I was having one of the biggest and most confusing conversations of my life. Our “defining the relationship” conversation started at around 11 p.m. and lasted till 3 a.m. It was all my fault. I didn’t come right out and say What are we? Instead, I began this long, convoluted story of how our college friends recently became official and asked Chris what he thought of that. I was so nervous to just come out and say it. Chris and I had both dated our best friends our senior year in high school, and the relationships had ended badly. We had gotten super close over the last month (you can read more about that here) and were both afraid to mess it up. It’s the best risk we’ve ever taken. Before I met Christopher, I hadn’t even wanted a relationship, but I could quickly tell that this relationship was different from any I had been a part of in the past. We said I love you quickly. We didn’t want to wait to get married until after college when we knew we were ready for marriage. (Such a bummer, though, because it meant we got married before Pinterest. ;)) One of these days, I will share about our wedding (I wanted to on our anniversary this year, but it turned out to be close to my surgery), but we got married the summer after our sophomore year in college. Nine years ago, I had no idea what an adventure we were starting. If you had asked me then what I thought my life would be like today, the answer would be extremely different from reality. My life isn’t what I expected. It’s so much better, all thanks to that conversation nine years ago. PS-I'm over on Ashley's blog today sharing five things you must do in one of my favorite cities in the world, Prague! awwwww happiest of anniversaries!! why wait when you know, right? Nine years!! You guys are so cute :) We're celebrating nine years next month!! That's crazy! K - So, are we together now? Me - Um, I guess so. HAHAHA :) Set the precedent for the whole relationship. Ha. Happy 9 years to you & Christopher! Happy 9 years! I love that you didn't want to wait to get married for any arbitrary timeline, you chose what worked best for you both! Happy 9 years! You guys are so cute! Congrats to you guys! Happy 9 years! 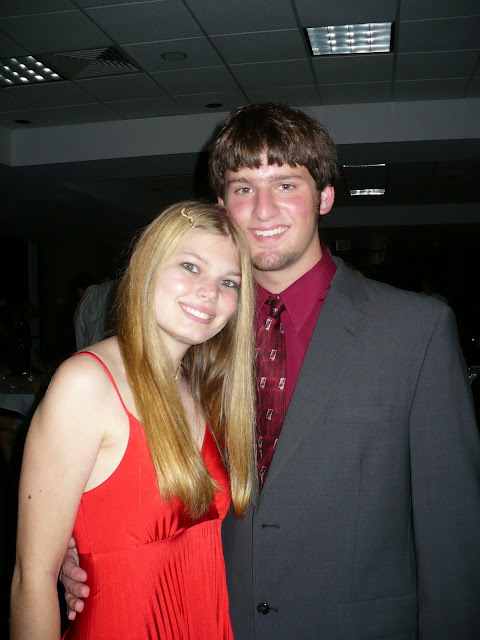 Look how cute you babies look at your freshman formal :) Happy anniversary! The sweetest. Happy 9 years! I love this! Happy 9 Years! Congrats and wishing you guys many more happy years! Congrats girl, sounds like you made the best decision :)! Wow! 9 years together!! I haven't even lived in one place for that long..! ;) Ooh, I love reading these stories!! You guys are too cute! !